On Monday, I wrote about the anti-amnesty "tea parties" that barely made an impact this past weekend. The showing from the ALL CAPS wielding blog trolls at ALIPAC was dismal. 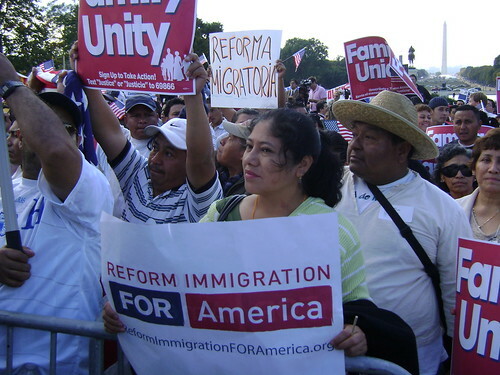 In stark contrast, the Reform Immigration FOR America campaign has managed to harness the grassroots energy of immigration reform advocates and organize over 900 house parties nationwide tonight! The parties will be held to participate in a national telephonic town hall where Rep. Luis Gutierrez will be laying out his plans for an immigration reform bill and the next steps in the fight to win. This represents some serious people power on the ground with enough momentum to keep pressure on Congress and push for legislation in 2010. This grassroots energy, coupled with last week's remarks from DHS Sec. Janet Napolitano about hope for reform in 2010 and David Axelrod's recent comments about the progress being made, makes me feel truly energized for the fight ahead. I know there are skeptics and I know there are those that feel like the inside-the-beltway-orgs have it all wrong in our approach, but the bottom line is this: there are thousands of people who want to make this legislation a reality, and tonight, they are going to come together to strategize on just how to make that happen. And that's powerful, no matter where you stand.